Like so many of us, Joshua Palmatier started writing in his early teens and never managed to shake the habit. 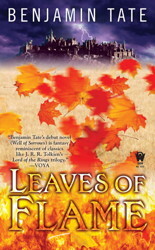 You probably know him for his fantasy trilogy (The Skewed Throne, The Cracked Throne, and The Vacant Throne), but he’s also making a name for himself as Benjamin Tate with a new trilogy (Well of Sorrows, Leaves of Flame, and the still-in-progress Breath of Heaven). 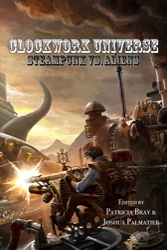 More recently, he’s started his own small press, Zombies Need Brains LLC, and is currently finishing up a KickStarter project to produce its first book, an anthology entitled Clockwork Universe: Steampunk Vs. Aliens. The project ends in just a few days, so after you read about Joshua’s most memorable meal, go back and click the link! LMS: Welcome Joshua; before we dive into the question of the day, let me wish you much success with your new press. Okay, now let’s get to it. What’s your most memorable meal? 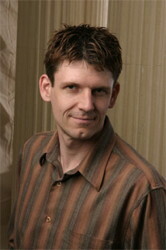 JP: My most memorable meal would have to be my first publisher’s dinner at Norwescon in Seattle, WA. It was a night full of new and unique experiences, ones that you can only live through once. And it carried with it all of the excitement and flavor of having sold my first three novels to a major publisher, DAW, meeting other writers from DAW that I’d been reading for years, and being a programming guest for the convention for the first time. The publishers arranged the dinner, of course, which means I don’t recall where we ate exactly. But it was a high-end French restaurant. I was nervous as we all gathered in the lobby of the hotel to take taxis to the restaurant. I remember more or less standing off to one side as the other authors—people like Kate Elliott, the then-unknown Patrick Rothfuss, Irene Radford, and others—all chatted and laughed. 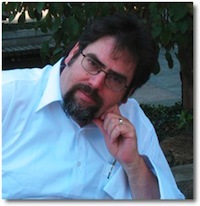 My editor kept pretty close to me, I recall, and made introductions. I already knew Kate Elliott, but everyone else was new to me. 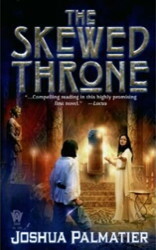 And no one knew of me yet, because my first book — The Skewed Throne — hadn’t been released yet. But everyone was welcoming. At the restaurant, I sat near Kate Elliott and my first shocker was that I couldn’t read anything on the menu, it was all in French. And there were no prices listed at all. Everyone got a kick out of my reaction, and they were all helpful is pointing out menu items, saying “You’ll like this!” without actually telling me what it was. So when it came time to order, I did it blindly, just pointing to things on the menu. I still don’t really know what it was I ate that night, certainly some kind of chicken (I hope it was chicken), a bitter salad, a scrumptious chocolate desert (I always go for the chocolate option), and the sauces! I’m a saucy boy. I firmly believe that the sauces on the food are what make the meal and these sauces were delicious! Everything was velvety—the sauces, the chocolate… OK, the lettuce wasn’t velvety, but everything else. Toward the end of the meal, when we’d all had far too much French wine and were far too full to move, part of the ceiling of the restaurant collapsed. It was startling, and we were all glad we were finished, since there was dust in the air afterwards, but by then none of us cared. We laughed it off and took that as our cue to end the evening and leave. So, an evening full of new experiences: new people, new food (I hope that was chicken), a little excitement to top it all off… what more could you ask for? This entry was posted on Monday, August 12th, 2013 at 7:30 am	and is filed under Plugs. You can follow any comments to this entry through the RSS 2.0 feed. You can leave a response, or trackback from your own site.